A further image with the pupils from Skinningrove Primary dancing on what looks like a cool May morning. Timm’s Coffee House (before it was re-developed) in the background. We asked : ”Can anybody assist with names?”. 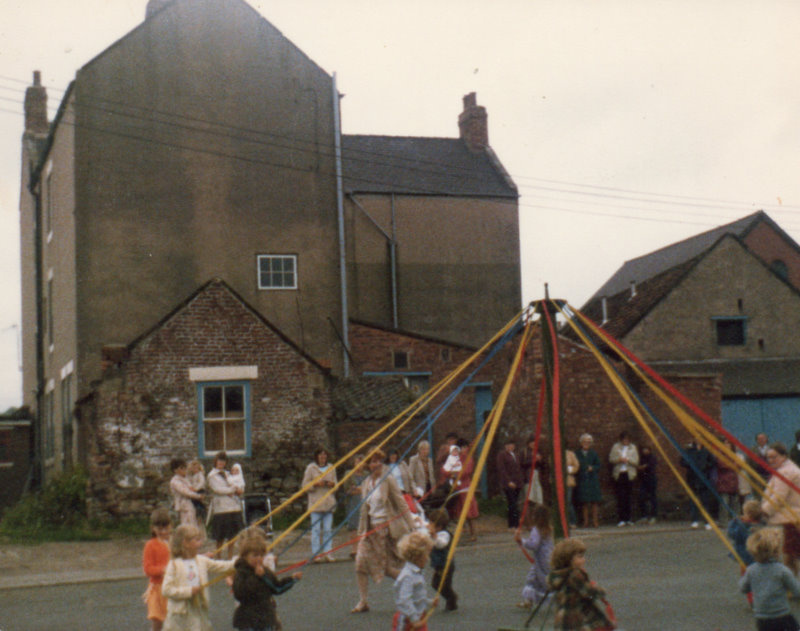 Andrea Foord has informed us: ”This photograph was taken at the May Day Maypole dancing in the Square in 1981. The children dancing were in the Nursery class with the teacher being Mrs Troughton. I am in the background holding my baby daughter Joanna; with my mother holding my eldest child Rebecca. The children would practice in the hall of the Nursery/ Old school for weeks before and a May Queen would be chosen and crowned by a ‘dignitary’! I had taught the Infant class prior to Rebecca’s birth and later returned for 3 years as a part-time teacher in 1983. Image courtesy of Kathleen Hicks and thanks to Andrea Foord for the update..
That building looks like Timms but totally different. Is that right. Photo was taken in early 1980s, before Timm’s underwent major alterations, particularly on the side visible in the photograph. This photograph was taken at the May Day Maypole dancing in the Square in 1981. The children dancing were in the Nursery class with the teacher being Mrs Troughton. I am in the background holding my baby daughter Joanna; with my mother holding my eldest child Rebecca. The children would practice in the hall of the Nursery/ Old school for weeks before and a May Queen would be chosen and crowned by a ‘dignitary’! I had taught the Infant class prior to Rebecca’s birth and later returned for 3 years as a part time teacher in 1983.